Have you every thought about making your own snow globes? They are very easy to make and really quite inexpensive. Make them as simple or elegant as you like. My mother use to get them for me at Christmas and I was really fascinated with them. So I thought to myself "why not make some" myself. You can make them for any occasion like birthdays, Halloween, Christmas, new baby, bridal shower or even vacations. Glycerin (available at drug store or craft stores) Helps to slow the falling snow. Figurine or whatever you want in the globe that is waterproof. The first thing to do is make sure your jar and lid and clean. If your figurine needs to be higher in the jar lid use some floral foam to lift it. Place the jar over the ornament and check the fit. If the ornament is high enough to view clearly, use silicone or aquarium sealant to glue the ornament firmly. Let this dry completely. Fill your jar with the distilled water and a few drops of glycerin. Be sure to use distilled, as it is less likely to cloud and be a breeding ground for mold. Donâ€™t fill completely full as the figurine will take up some space. Add the glitter of your choice to the jar. There are colors to match any season and any theme, even some that resembles snow. Put the lid on the jar and invert to see how you like it. If there is enough glitter than you are fine. If you think it needs more than put some more in. As soon as you have it just the way you want it, take the lid off and make sure that the rim of it and the jar are dry. Apply the glue and screw the lid back on tight. After it is dry then turn it over and you can decorate it any way you want. I usually make a base out of wood and then I put my ribbon or whatever I want on it and set the globe on top. You can also just put ribbon or lace on the jar lid. Your snow globe is now finished. They make great gifts and children love to help with them. Just use your imagination and you will be able to come up with some really different ideas. 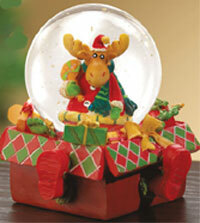 If you have any questions or snow globes ideas please contact me and I will add it to my site.